What has been referred to as “Office 12,” the next version of Office has been officially named. And the new name is: “Office 2007“. ZDNet has a good article providing the details on what bundles will be, some of the new options and of course the official name. Check it all out here. Life just got a bit better! While I am not a coffee connoisseur, I enjoy good flavor and something nice and hot while working backstage. Of course being backstage does not afford many opportunities to find a good coffee drink. But now a hot latte is always in my bag! 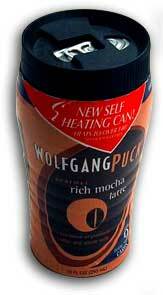 Enter Wolfgang Pucks’ self heating can. Pull the lid off the bottom – push in the tab to release the heating chemical reaction – wait 5 minutes – open the top and enjoy a hot Mocha or Carmel Latte! And if you’re really curious, here’s a review with photos of the can in action. I have just added a project write-up and movie that was ‘authored’ in PowerPoint. It is a good example of how PowerPoint is moving beyond PowerPoint and evolving into much more than slides for a presentation. Check it out here. We all have some perks from our profession. For me one recently occurred. I was asked to clean up the presentations for a corporate event and optimize the 40+ movie files so they would actually play when needed. All the work went great, but the producer called and requested I be there one evening to pick up some additional files – a bit of an inconvenience, but I agreed. When I arrived I was treated to a very cool, very candid Lance Armstrong speaking to a small group – A VERY COOL PERK! Today the presentation I have been working on for the past several weeks went off great! The Detroit Auto Show hosts “press days” before it opens to the public. On these days all of the auto manufacturers wow the press with keynote speeches, incredible staging and unveiling of new cars and of course great PowerPoint presentations! This year I am working with Kia as they recap their steady growth and unveil the new “Soul” concept sport utility vehicle. Just two posts ago I mentioned OfficeFX for it motion backgrounds, transitions and text antialiasing. I used it extensively on this presentation.